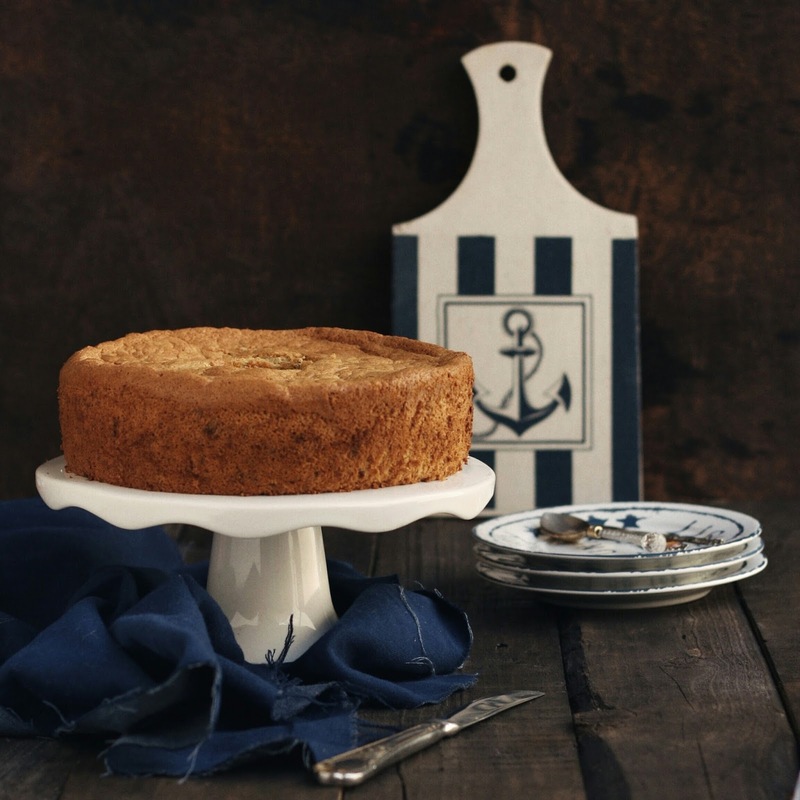 What is the most essential thing when you make banana cake? Overripe, old and ugly banana with full of dark spots. Yep, a fragrant, moist and banana-y banana cake could only made from the last thing you want to see in your banana. Isn't it amazing, how an ugly thing can turn into the most beautiful one? 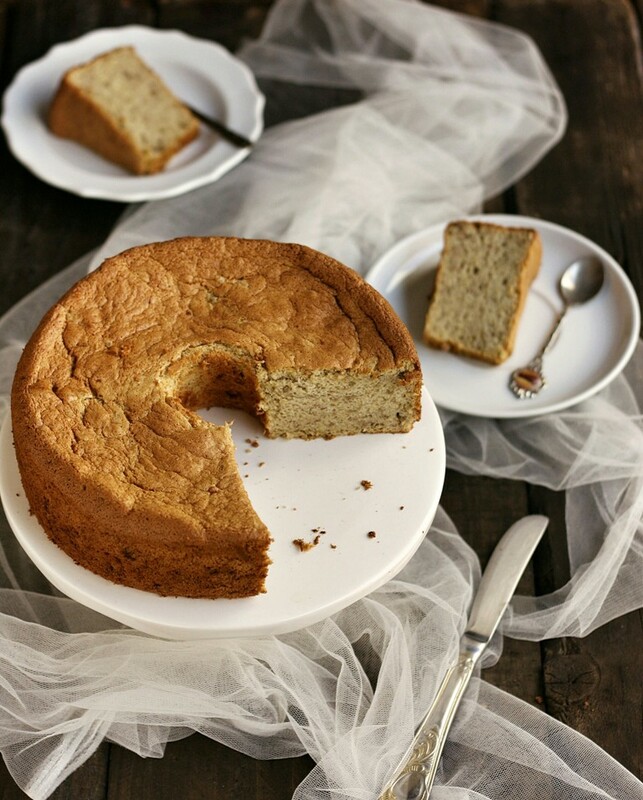 This Banana Chiffon Cake is really a keeper (thanks soooo much KT!!). No matter it shrank, too dry or slipped from the pan, I will never look upon another recipe. The taste is really banana-y, the texture is moist and fluffy, and the smell is so fragrant. The secret is in the comparison of banana vs flour. 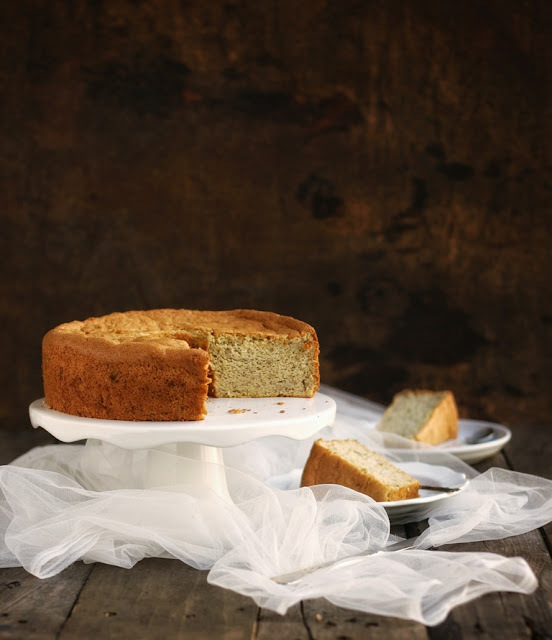 Most recipe have ratio 1 part banana :1 part flour, while this amazing recipe from Kitchentigress have 2,5 part banana to 1 part flour. 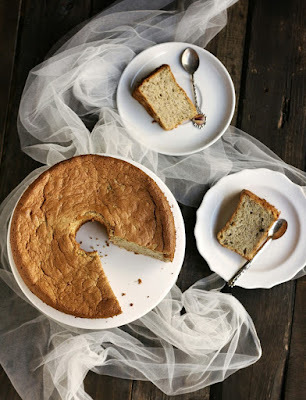 Sssstt, this is my fifth banana chiffon cake using the same recipe. Unfortunately, my oven thermometer is broken so I wasn't sure about the oven temperature, I guess it was too hot so the cake shrank as it cooled down and a little bit wet inside. But the taste is still the same, very banana-y. I could eat half of the cake by myself in an hour! Since my chiffon pan is 20x10 cm, so I double 1,5 from KT's recipe. Sift the dry ingredients into a bowl. In another bowl, blend the wet ingredients. Pour the yolks mixture into the flour mixtures, whisk to combine. In separate bowl, beat the egg whites and caster sugar until firm peaks form. Gently fold the egg whites into the batter in 3 batches. Pour the batter into prepared chiffon pan. Jiggle the pan to level the batter. Bake for 60 minutes. Remove from oven, turn upside down until cool. Trim the cake out of pan, serve.